In keeping with my recent austerity beauty MUA review, I thought I'd look at another wallet friendly product, this time under the skincare category. Skin Deep is never going to be a budget blog as that's not a true reflection of the products which I personally opt for. However, you'd have to have been living on the moon not to realise that times are tough and so I am intending to review a few more affordable brands (under £10) and would love to hear your thoughts. 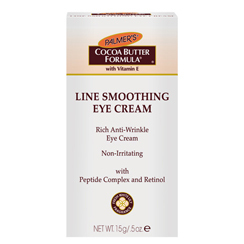 Palmer's is a popular drugstore brand, best loved for its stretchmark fighting cocoa butter range. In the last year, Palmer's launched a skincare line and today's review is of the Line Smoothing Eye Cream from the range, costing a wallet friendly £6.95. The packaging reflects the distinctive Palmer's branding but is a little non-descript. It certainly wouldn't jump out on a shelf without the brand awareness and it does look like a budget product. The box is rather large given the 15g tube inside so it's not going to score any points with eco warriors either. Having said that, the packaging boasts that the cream contains vitamin E and retinol and this intrigued me to see how results driven it would be. The directions for use were clear and the packaging functional. Palmer's Line Smoothing Eye Cream is described as having a fresh white lily fragrance. Personally, I couldn't detect this and would describe it instead as cocoa butter and whilst this was by no means offensive, I'd have prefered it to be unfragranced. By far the best thing about Palmer's Line Smoothing Eye Cream is the formula. It's light, non-greasy, easily absorbed and the ideal base for makeup. The eye area is left feeling moisturised and if you're looking for a product to do just this, I would recommend Palmer's Line Smoothing Eye Cream. I'd also recommend it to anyone looking to buy their first eye cream. I can't say that I noticed any significant line smoothing results and in this respect, I was a little disappointed as I don't feel that it lives up to the name or the suggestion that it is a results driven product based on the inclusion of retinol. If you're looking to target fine lines, I wouldn't recommend this product.